"ਜ਼ਿੰਬਾਬਵੇ ਦੀ ਧਰਤੀ ਨੂੰ ਭਾਗ ਲੱਗਣ"
^ਅ The Zimbabwean Dollar is no longer in active use after it was officially suspended by the government due to hyperinflation. The United States Dollar, South African Rand, Botswana Pula, British Pound Sterling, and Euro are now used instead. The US Dollar has been adopted as the official currency for all government transactions with the new power-sharing regime. ↑ Beaver County Times (13 September 1981). "Zimbabwe". The Beaver County Times. Retrieved 2 November 2011. ↑ CIA (2011). 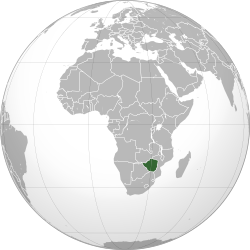 "The World Factbook – Zimbabwe". 2011. Central Intelligence Agency. Retrieved 2 November 2011. ↑ "Population 2012 Country Ranks". Countries of the World. Retrieved 15 October 2012. ↑ 4.0 4.1 4.2 4.3 "Zimbabwe". International Monetary Fund. Retrieved 24 April 2012. ↑ "Zimbabwe Currency". Wwp.greenwichmeantime.com. Retrieved 21 August 2011. ↑ "Census Results by Year-End". New Zimbabwe.